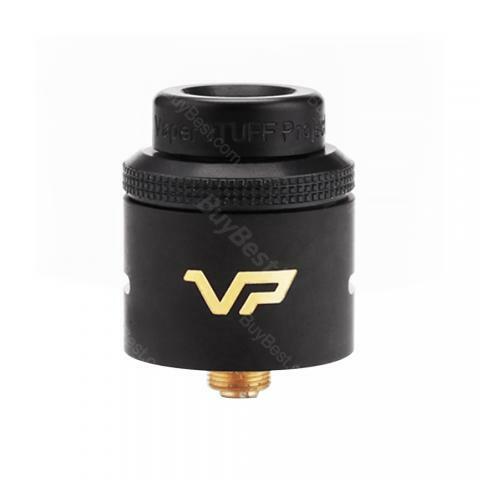 Hellvape VP RDA, a VaperSTUFF Indonesia project, is a 24mm dripper atomizer with black 810 PEI drip tips. It comes with triangle post design with slope post – holes, which ensure an easy building and quick flavor production. Designed by VaperSTUFF Indonesia, Hellvape VP is a 24mm dripper atomizer with black 810 PEI drip tips. It comes with 24K gold-plated post & deck for perfect electronic conductivity. The triangle post design with slope post – holes can ensure an easy building and quick flavor production. Together with adjustable black PEI top cap and dome system, VP RDA provides you a warm vaping experience with dense flavor. The included BF pin is also a plus for squonker lovers. • It doesn't come with e-juice, you shall buy it separately. Great rda, nicely made and good flavour! Great service from B.B. too! Für den Preis ist das Set echt gut. Hellvape VP ist chic. Leichte Handhabe, gute Rauchentwicklung.